It's like a little scrapbook of the soul. Journaling is one of my favorite ways to practice self-care. Bullet journaling. Morning pages. All of it. I’ve been journaling in one form or another since I was 8 years old, and last year, I started keeping a new journal that I’ve really been loving: my heartsong journal. The idea of the heartsong journal grew out of the fact that I had a handful of spreads and lists that I kept copying over and over into my new journals — or I wouldn’t take the time to copy them into my new journals, so then I’d find myself regularly going to my bookshelf to pull out, say, my June-August 2016 journal to look up a specific list I’d written out at the time. Finally, it dawned on me that it would probably make more sense to just write all of these things in their own separate notebook. Though this little reference journal started from a really practical place, it's since evolved into something a lot closer to my heart (hence the name). After I started it, I discovered that having a single notebook where I document the things that are meaningful to me and that make me who I am is really grounding, especially when the world around me feels out of control. It's like a little scrapbook of the soul. And if you can’t think of a ton of things to put in your heartsong journal initially, that’s OK! New things worth adding to the journal will just sort of reveal themselves to you as time goes on. I didn't have much in mine at first either; after all, new entries sort of have to stand the test of time (of like...a few months, heh) before I add them in. I recently turned the act of updating my heartsong journal into a little bit of a ritual. At the end of each month, I set aside a night for it. Then I light a candle (typically the expensive one I always tell myself that I’m “saving for a special occasion” and thus never actually burn); make tea; moisturize; put on my most cozy/luxurious house clothes; and sit down with my heartsong journal. If I don’t have anything new to add — which, TBH, happens quite a bit — I re-read the things that I’ve written over the past two years, and just do a little self-reflection, intention setting, etc. When I'm done, I'll spend some time wrapping up the previous month in my main journal and working on my spreads for the month ahead. It's basically a little self-care date night with myself, and whenever I do it, it feels so luxurious and soothing and nice. Not everything in your heartsong journal has to be mega deep, but it’s probably going to be the things that feel slightly more constant and higher-level than, say, your everyday habit tracker. Speaking of habit trackers, I don’t really do creative or elaborate spreads in my heartsong journal...for me, it’s more about just letting the words shine through, and I really appreciate the simplicity of it. But, of course, you should do what feels right to you. A note about notebooks: I think it’s worth it to use a journal that feels a little more elevated and luxurious than your everyday journal. It doesn't have to be fancy or expensive, but it should feel special and spark a little joy in your heart whenever you look at it. 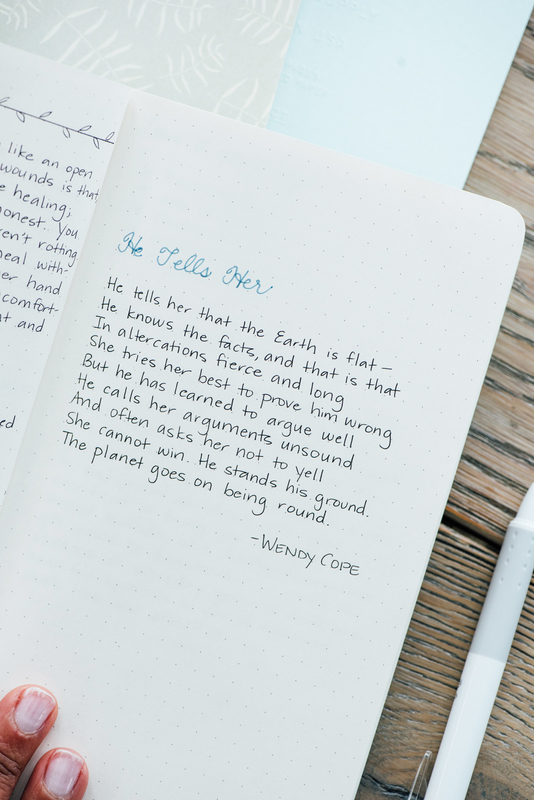 I use a mint green Public Supply dot grid journal ($16), but you should use whatever journal inspires you. And while I initially didn't set up an index or page numbers in mine, I recently added them in because I’ve realized it’ll be helpful now that I’m adding more to my heartsong journal. But — these are all guidelines! Ultimately, your heartsong journal is for you. 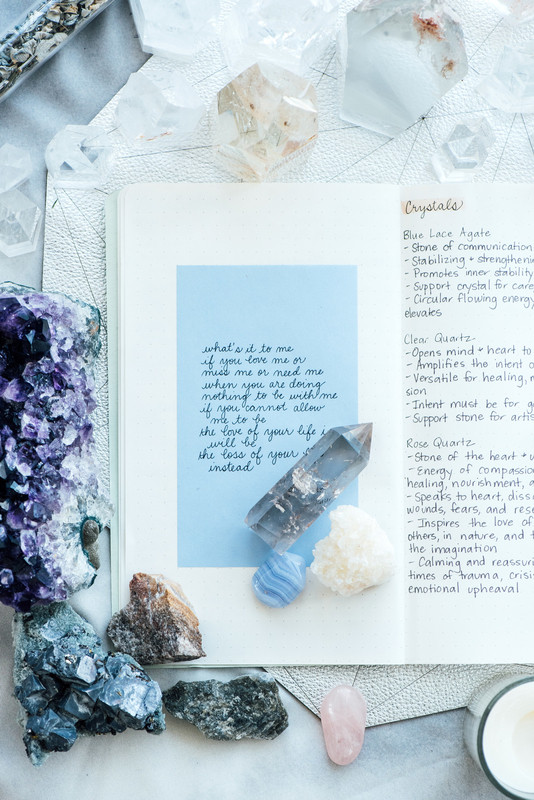 A heartsong journal is this private, special thing that doesn’t need to speak to your Instagram followers; it only needs to speak to you. Like, that’s the entire point. 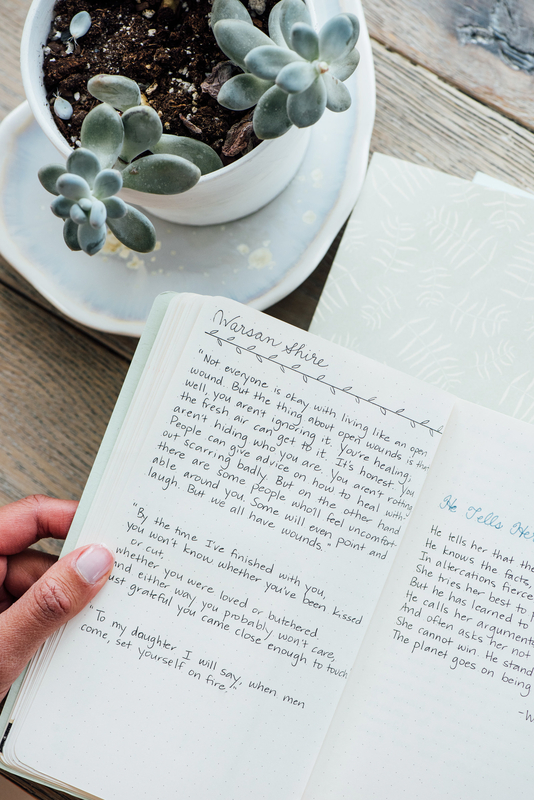 A heartsong journal is just a simple way to document and honor what’s in your heart, and remind yourself that even though life can feel really dark and difficult at times, you are still here, and you are enough. If you're curious, here's a bit more info on some of the references in the pages shown above: Lemon butter pasta recipe, soothing tea recipe, 16Personalities test, the five love languages, poetry by Warsan Shire, poetry by Rupi Kaur, "Differences of Opinion" by Wendy Cope, and natal chart by Susan Miller. Other notes: the pink tea is Forever Nuts, the pens are from Poppin and Pilot, the teapot is from Pinky Up, the brass binder clips are available on Amazon, and the gold floral washi tape is from Paper Source. Photo styling: John Gara. Thanks to ABC Carpet and Home for loaning us the large crystals and other assorted sundries.